Purchasing an in-ground swimming pool is a major decision. There are many shapes and sizes to choose from but choosing the best shape and size is dependent on the available space in your backyard. Another thing you need to consider when having your pool designed is making sure that the pool design will match with your home and the surrounding area. When designing your pool one of the most exciting steps in the design process is customizing your backyard’s pool with different pool add-ons. With many add-ons to choose from, the possibilities for your dream pool are nearly endless. You may find a few things to read on pool add-ons to help you understand what some of your options for pool features are, or maybe an article about what the five, ten, or even twenty best pool add-ons are. Platinum Pools is sure to have what you are looking for to make your oasis the perfect one for you. Do your homework and make a list of what features and add-ons you would like to have included in your swimming pool. 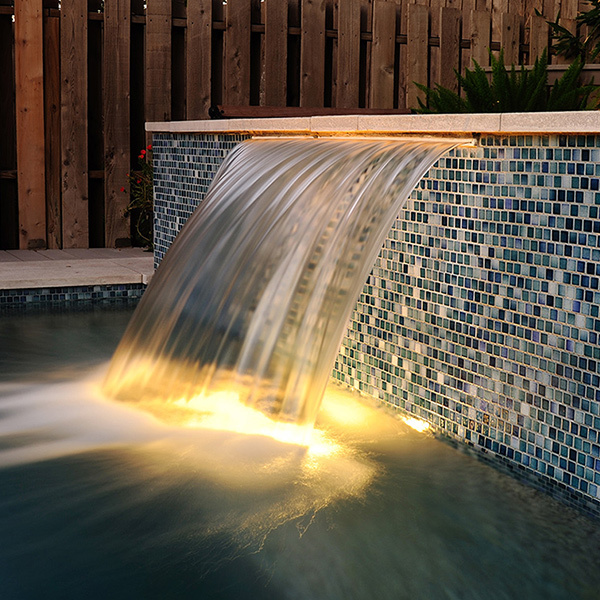 Adding a water feature converts a swimming pool from ordinary into extraordinary. Water features add beauty, relaxation, and fun for the children. Due to the many benefits of adding water features to a pool, they are one of our clients most requested add-ons. Within the water feature group, there are numerous different options to choose from including gushers, pencil jets, sheer descents, scuppers, weeping walls, waterfalls, and grottos. Since the Jacuzzi Brothers invented the jet spa, spas have also been one of the most popular pool features. To help decide the size and shape of your spa you need to consider a few things. 1. How many people will be using the spa at the same time? 2. What spa shape/design will go well with the shape and design of your pool? The combination of a swimming pool and spa should go hand in hand. It is important to make sure that your spa adds to the beauty of your backyard oasis and fits in naturally with the rest of its surroundings. Remember, if you are looking for relaxation after a hard day’s work, the spa is the best pool feature for you. Decking helps your swimming pool become the focal point of your backyard. This vital feature ties the décor of your home, pool and the landscaping together. Decking also gives you an area where you will place your patio furniture, and entertain your guests. There are a few different types of decking available to choose from: flagstone, flagstone inlay, hand-seeded p-gravel, pattern concrete, pavers, slate, textured deck coating, travertine, and color salt. The significant part of building your pool with Platinum Pools is that you get an expert designer that will take you through the process of how to best choose the style you want. Fire features are another great add-on that adds extra beauty to your backyard oasis. Having fire features encourage homeowners to do more outdoor activities, even during the colder months of the year. So, if you think that you can’t enjoy the evening due to cold weather, then it’s time for a fire pit. There are fire pits and bowls in all sorts of shapes and sizes to choose from. Fire bowls serve as an excellent background for a custom-made pool with fountains, or just have a fire pit for an evening of marshmallows or s’mores. Like the swimming pools Platinum Pools builds, Platinum Pools also uses the best materials when building your outdoor kitchen, meaning your outdoor kitchen will last for years to come; an outdoor dining experience you and your family can enjoy anytime. Other accessories can make your oasis even more personalized and built to your expectations. There are endless possibilities to choose between, an in-pool bar stool and table, a beach entry, a tanning deck, a stream from your spa to your pool, a splash pad for your kids, and even a tanning shelf. If you think that you don’t have enough space in your backyard, a combination of a pool and spa known as a “spool” can help make your dreams of having a pool in your backyard come true. Remember, Platinum Pools is the place where we make your custom-made pool dreams come true. Call us at 281.870.1600 (Houston), 409.898.4995 (Beaumont), or 361.576.0183 (Victoria). You can also visit our website for a free quote.